From the way you responded to Ms Ffrench, it seemed as if our voices fell on deaf ears. I read your article from the first line to the last. I cordially request that you peruse mine. too many times that conditioned you to deliberately distort facts in an attempt to garner attention and ratings, also to rewrite history on behalf of your “sources”. What else would posses you to write such a vile, scurrilous, unsubstantiated and colorful fiction on the second year death anniversary of “The Greatest Artist of All Time”? Mr. Jackson left behind a superb legacy, you had a vast arsenal of material. Yet you couldn’t bring yourself to pen couple of lines of tribute words, at least highlighting his artistic and philanthropic legacy. On the contrary, you slandered a dead man who is not here to defend himself. This is a new low for you! And before we can bounce back from our dismay, you posted a related article, affronting your readers who put you on the map. Bluntly put, who is Roger Friedman if it isn’t for his posts about Michael Jackson? Now that he is dead, you hound Lady Gaga, hoping to steal a speck of her shining light. How would you feel if we insulted YOUR loved one on the anniversary of his/her death? You published an incendiary commentary so you shouldn't bemoan about the flames. The fans weren’t “crazy fan-anatics” until they called you out. What course in journalism thought you to offend your readers? Did you even take courses or are you just the go-to guy for “sources” because you have a poisonous pen & a press badge for sale? You are a middleman bottom feeder who gives platform to anonymous bottom feeders. a badge of honor! We are protective of him because, as you will agree, he was an extraordinarily gentle person who exercised admirable restraints to his adversaries. And to state the obvious, he doesn’t have a family to stand up for him. So WE stick up for him out of genuine care. That is trait to be admired, not to be trivialized. The real credit goes to Michael Jackson who inspires a legion of worldwide people to stand up for him. This is Roger Friedman calling the pot biased. When have facts every mattered to you? How many times have you called Mr. Jackson’s representatives to corroborate claims by “sources”? Aren’t you predisposed to always giving credence to “sources” over Michael Jackson? What a comical irony is that in the very article you question our ability to recognize truth, you published a Raymone Bain email in which she lambasted YOU of printing lies about her and Michael Jackson. "Back in 2005, I wrote that another longtime Jackson associate, Frank Dileo, had visited Michael at Neverland during his child molestation trial. He found a set up in Michael’s bedroom of an IV. DiLeo told me at the time it was clear that something was being administered to Jackson"
Thank you for inadvertently informing us that whilst he was trying to slime his way back into Michael’s good grace, Dileo was feeding a gossip columnist! This the very reason Michael Jackson sacked Frank Dileo in 1988. Boy, did Dileo call it or what? “WOW! All in one article, too. I have NEVER read so much garbage.” wrote one of your readers. Since you are the messiah of “truth”, let’s examine your facts, shall we? Mr. Friedman, can we agree on the premise that in considering the veracity of your claims, it is important for you to at least be accurate in known, basic facts? I don’t know whose 1996 Dangerous Tour you refer to but Michael Jackson’s Dangerous Tour ended 1993. I presume you meant the parrot a claim that in African leg of HIStory Tour (5 concerts total), Michael allegedly had Neil Ratner give him Propofol. Cirrhosis is when healthy liver tissue is replaced with scar tissue, eventually preventing the liver from functioning properly. Fatty liver, drug and alcohol abuse lead to cirrhosis. of the Propofol bottle (25ml, 50ml or 100ml), the drug concentration is only %1 Propofol. The rest is soybean oil , glycerol, sodium hyroxide and purified egg. So Propofol has high fat content due to oil and egg. Prolonged Propofol abuse would have caused fatty liver, eventually cirrhosis of Michael's liver. His liver was “unremarkable”- HEALTHY! As far as diffusing falsified media lies about Neil Rather allegedly administering Propofol. Maureen Orth reported in 2004 Vanity Fair that Michael's former employee, Myung-Ho Lee told her that Michael hired Dr. Neil Ratner in 1999 TO DETOX Michael from Demerol and Morphine, not to give him Propofol. Your contention that “he never stopped” is appalling. If Mr. Jackson had someone to administer Propofol to him or he “injected himself” as you claim, why would he need a Conrad Murray? Michael Jackson's autopsy showed no indication of drug or alcohol abuse. The only drugs found in Michael's body were the ones administered by Conrad Murray THAT MORNING. Not even drugs prescribed by Kline and Mertzger were found. Incidental findings of the autopsy were enlarged prostate, Vitilago, polyp of the colon (common in everyone, google it), inflammation & scarring of lungs and some arthritis, notably in spine. “The inflammation and scarring of the lungs” were due to lupus. Purported prior usage of Propofol is IRRELEVANT to the Conrad Murray Trial. Michael didn’t die under another doctor’s care, he died under Murray’s care! He didn’t die due to cumulative effects of some drug addiction. Michael died because of direct actions and inactions of Conrad Murray on that very morning. The autopsy report already refuted claims of prolonged use of drugs by Michael. Media deludes itself into thinking that the repetition of falsehood will change scientific facts. I hope you didn’t strain your brain, coming up with this subtle yet cunning innuendo. Substantiate your claim about the administration of Propofol by one doctor first before making a leap to administration by multiple doctors. And what did your thorough corroboration with medical professionals reveal to be recommended guidelines for Murray to have been doing “it properly”? “it properly” even if he had TWO of each medical equipment he needed. A layperson will think, after reading your article that Murray prescribing, buying, transporting across States and administering Propofol was proper and in accordance with the Hippocratic Oath but his mere method was what was improper. It is your journalistic responsibility not to perpetuate misinformation amongst unsuspecting public. 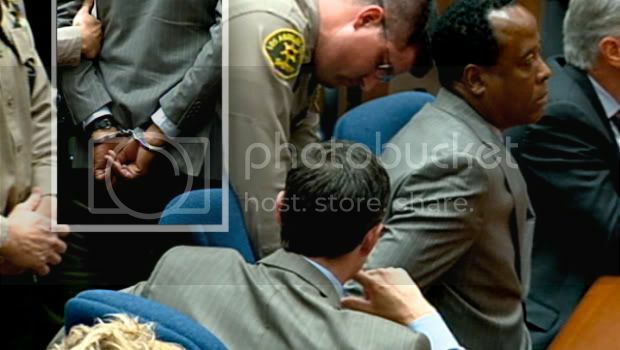 Conrad Murray is someone California Medical Board referred to as “danger to public”. Medical professional after medical professional testified during the Preliminary hearing that the treatment he provided was substandard and unacceptable. This “doctor” as you undeservingly refer to as, opted to hide evidence that would implicate him than to try to save his patient in a small window of opportunity where there was a chance. How would you feel if you were the patient lying there unable to breathe, and instead of providing you the much needed oxygen, your doctor leaves you there dying while he hides evidence? Oh, never mind, you can’t feel anything because you would be dead! a loved one on the receiving end. You are so blinded in your thinly veiled animosity against Michael Jackson that you are aiding someone that could potentially harm or take the life of another fellow human being. I invite you to consider the bigger picture. FRANK CASCIO BOOK "Michael: My Friend"
Books? How many books Cascio will publish in the name of cashing in on the death of his “friend”? Cascio Family remained close to Michael 25 + years due of your their discretion. Had they broken Michael’s confidentiality while he was alive, they knew that he would have severed ties. Cascios stated that Michael craved normalcy and privacy. What part of Michael’s privacy does this book fit into? Why didn’t Frank Cascio publish this book when Michael was alive? It wasn't okay then, it's not okay now! to boost book sales but it was a colossal miscalculation that will backfire. Vultures exploiting their connection to Michael Jackson always contend that they were Michael's “friend” If Michael Jackson had a true friend, he would have been alive! their mother, Katherine was. Jermaine and Latoya have the benefit of their mother’s account. I would rather read the second-hand account of Michael Jackson’s life from Jermaine and Latoya than to read the first-hand account by Frank Cascio –a charlatan who opted to jump on the gravy train to profit from his "friend"’s death. especially if it involves…as you pre-indicated…speculation of prior Propofol use. It WAS a spider Bite! my leg. Pus was oozing out" That's what happens in the initial stage. There are lots of youtube videos where people squeeze their pus from their brown recluse spider bites. They are too graphic to post but here is a picture (warning, graphic!) This pus is what carries the venom. The wound is lanced (busted) and irrigated (pus squeezed out). The patient is given antibiotics. Then it forms black scab like Michael's. "It dried up and became a big scab. It is now in the state of healing" said Dr. Alex Farshchian. Here is Michael's spider bite. 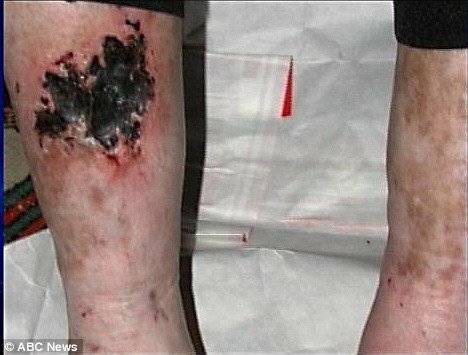 Here is an online brown recluse spider bite (similar to Michael's. Notice the black scab starting to form as it heals). 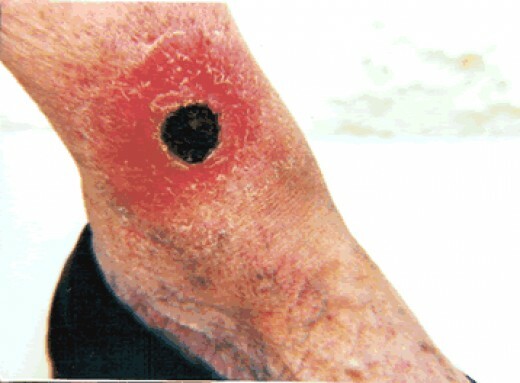 Here is a picture with black scab. Here is a picture similar to MJ's before it forms scab. Michael's spider bite was sensationalized by media to garner ratings. Why is it always Michael lying but disgruntled former friends & employees and "sources" telling the truth? I present you your own words: “Michael Jackson was killed before the payments could be processed"
”Did he self inject on June 25, 2009?" The answer is an emphatic no. If you were following the Preliminary Hearings, you would have known that Michael self administering is out of the realm of possibilities. This is the very reason that Murray defense Team went from “Michael injected himself” to “Michael drank Propofol” theory. Medical experts and the coroner’s office testified that evidence doesn’t support self administration. You would think that by now, the coven of witches (namely you, Maureen and Diane) would have exhibited some creativity. You all are rotating the same tired ol' "Jesus Juice" drivel for a decade now. Michael was a grown a$$ man who is allowed to drink if it pleased him. Who cares if he drank out of soda cans, a sippy cup or a pimp cup? How is his cup of choice any indication of a criminal offense or any of your business? Vanity Fair published a scathing article by Maureen Orth in its Feb 2004 issue. Allegedly Michael gave wine to Gavin Arvizo on a flight from Miami to LA. She also claimed that Michael gave wine to Richard Matsuura when he was 12 year old. Matsuraa categorically denied that Michael ever gave him alcohol either in glass or soda can. If this one allegation is false, how can we trust the accuracy of Maureen's other claims? Michael Jackson did NOT give any alcohol to any minor! In 2005 Trial, Tom Sneddon called to the stand 2 flight attendants. Cynthia Ann Bell worked on the flight Maureen Orth alleged that Michael gave alcohol to Gavin. nervous flyers that you had ever seen, correct? -- Whose idea was it to serve Mr. Jackson alcohol in a Diet Coke can? -- When did you formulate that idea? -- Did Mr. Jackson ever tell you to serve alcohol to him in Diet Coke can? to see him drinking alcohol, right? -- Have you ever seen Mr. Jackson share his can of wine with anyone else? -- You never saw Arvizo children drink from a Diet Coke can of wine at any time? The second flight attendant who took the stand was Lauren Wallace who that she served Michael wine in Diet Coke cans on private jets in 2003 and 2004. -- You understanding is that Mr. Jackson didn’t want his children see him drink, right? any children intoxicated on Mr. Jackson’s flights? Mind you, these were the prosecution's witnesses. Tom Sneddon turned over every rock to find evidence to support Michael’s guilt. There was no evidence of evidence. If it wasn’t for the agony the 2005 Trial caused to Michael, we would have thanked Tom Sneddon for his meticulous, by-any-means-vendetta. Michael was found NOT GUILTY on ALL counts, including the 2 counts involving giving alcohol to a minor. Michael was a single parent and he took his children where ever he went. He drank wine out of soda cans because he didn’t want to be a bad example to his kids or any kid in his company. You don’t go on and on about parents who drink/smoke/do drugs in front of their children but you got a problem with Michael drinking wine out of soda cans? You talk as if Michael got 8 hours a day sleep but he wanted to sleep more to escape some pain. Michael didn’t have 8 hours plus to sleep, He started his day with voice lessons with Seth Riggs then 2 hours a day dance rehearsals with Travis Payne then attended 8 hours of rehearsals. On top of it, he was raising 3 children. Michael told Corey Rooney that preparing for a Tour drains him due to his perfectionist nature. He had an upcoming Tour he was looking forward to and working very hard for. He didn’t have time to "constantly" sleep. He wanted recommended 8 hours of sleep. Mr. Friedman, as a journalist, you assume responsibility to your readers to bring them facts, not speculations to serve agendas of people who pulls your strings -Frank Dileo, John Branca, to name a few. It appears you have personal feelings against certain individuals in Michael Jackson camp – Michael himself, Raymone Bain, Joe Jackson, Brian Oxman, to name a few and your bias isn’t so subtle. Do your best, Mr. Friedman. All you can accomplish is virulent journalists to copy paste your falsified propaganda across the net. What is new? But if you are following the Trial, you will notice that none of these cheap games play any role in the court of law. The following is testimony by Richard Ruffalo is an expert anesthesiologist & clinical pharmacologist during Conrad Murray Preliminary Hearings. His knowledge and expertise illuminated a lot of medical issues surrounding Michael's death. - “Is the propofol properly indicated for the treatment of insomnia? When you give this combination of drugs, especially with Propofol in the mix, it could easily lead to severe problems. You have to be constantly present and vigilant. If you need to leave, you must have a trained individual take over the monitoring and relieve you. If you walk out, bad things can happen. You come and the patient stopped breathing. No matter what, you are responsible %100 for the safety of the patient. The blood levels aren’t indicative of someone orally taking them. If someone ingested Propofol, their concentration in the stomach would be much higher. Extreme departure from standard care is acts that are so egregious that any physician with some sense of training should know. Even if Mr. Jackson self administered, the level of care provided by Dr. Murray was substandard. Even if Murray left the room and Mr. Jackson overdosed, it still doesn’t change these deviations. Moreover, this would create an additional extreme deviation. If Dr. Murray thought that his patient was forming an addiction, if he knew that Mr. Jackson liked to push Propofol himself, it’s safe to assume that we have a high-risk patient. So if the patient isn’t satisfied with the amount you gave him, there is a potential that he may reach for Propofol when you leave the room. This is same as leaving a syringe full of heroin with a heroin addict. He claims that this patient likes his milk and he gets upset if he doesn’t get his milk. What do you think the patient might do if you leave him unattended? Failure to anticipate that he may inject it, drink it or whatever is an extreme deviation from standard of care. He [Murray] said he [Michael] likes to push it so why would he drink it?